Moms are the best! It’s time give back and make them feel super on their special day. 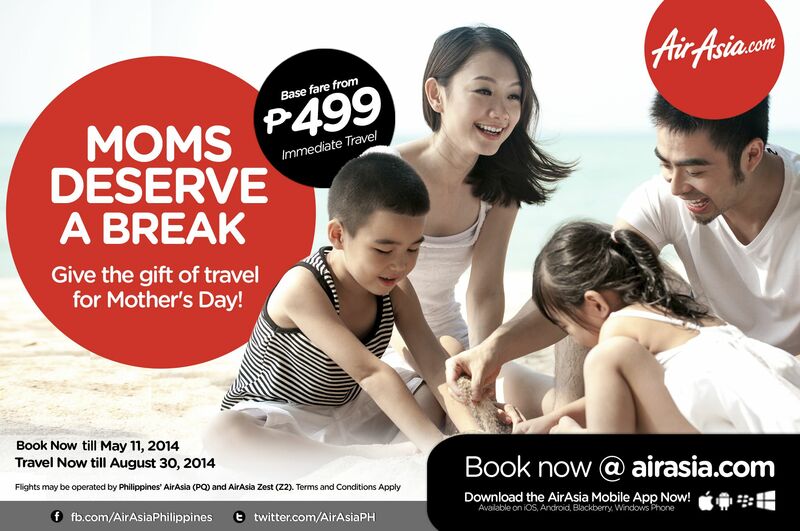 Treat them this coming Mother’s Day and give the gift of travel! Avail of AirAsia’s promo for this week, Base fares start at P499 only! Book now at www.airasia.com! May it be a getaway at the beach, a rewarding relaxation with the grandeur of nature or a shopping and pampering spree day, our destinations are perfect for your mom and the whole family! Fly to/from Manila, Boracay (Kalibo), Bohol (Tagbilaran), Cebu, Puerto Princesa and Tacloban or fly abroad to Kuala Lumpur, Kota Kinabalu, Shanghai, Macau and Seoul (Incheon)! Avail your treat for her at www.airasia.com!